Over the past two years, Rosetta has kept a close eye on many properties of Comet 67P/Churyumov-Gerasimenko, tracking how these changed along the comet’s orbit. A very crucial aspect concerns how much water vapour a comet releases into space, and how the water production rate varies at different distances from the Sun. For the first time, Rosetta enabled scientists to monitor this quantity and its evolution in situ over two years. In a new study led by Kenneth C. Hansen of the University of Michigan, in the US, measurements of water production rate based on data from ROSINA, the Rosetta Orbiter Spectrometer for Ion and Neutral Analysis, are compared with water measurements from other Rosetta instruments. The combination of all instruments shows an overall increase of the production of water, from a few tens of thousands of kg per day when Rosetta first reached the comet, in August 2014, to almost 100,000,000 kg per day around perihelion, the closest point to the Sun along the comet’s orbit, in August 2015. In addition, ROSINA data show that the peak in water production is followed by a rather steep decrease in the months following perihelion. The water production rate measured at Comet 67P/C-G as a function of the comet’s distance from the Sun (in astronomical units, au). The measurements are from ROSINA-DFMS (blue diamonds); MIRO (yellow circles); VIRTIS-H (solid green triangles); VIRTIS-M (unfilled green triangles); RPC-ICA (red triangles). The dust production rate, estimated from ground-based observations, is indicated in tan crosses. The data span the period between June 2014 and May 2016. Image adapted from Hansen et al (2016). “We were pleasantly surprised to find such a good agreement between the data collected by all the various instruments in this unprecedented study of the water production rate’s evolution for a Jupiter-family comet,” says Hansen. The scientists analysed almost two years’ worth of data from ROSINA, which detects neutral water molecules with its Double-Focussing Mass Spectrometer (DFMS). “This is by no means trivial: ROSINA performs measurements locally, at specific points around the comet, and we need a model to extend them to the entire atmosphere,” adds Hansen. The simplest model would be a spherical distribution of the outgassing centred around the nucleus but, given the complex shape and season cycle of Comet 67P/C-G, this would be a very crude approximation. For this reason, the ROSINA team developed a series of numerical simulations to accurately describe the comet’s production of water, which are presented in a separate study led by Nicolas Fougere also of the University of Michigan. From these simulations, which showed that the water production rate at a comet like 67P/C-G is highly inhomogeneous, Hansen and his colleagues derived an empirical model, which they then used to transform the local ROSINA measurements into estimates of the overall water production rate. The results revealed that, during the first several months of observations, when the comet was at distances between 3.5 and 1.7 astronomical units (au) from the Sun, water was predominantly produced in the comet’s northern hemisphere. The water production rate predicted the simulations as Comet 67P/C-G approached the Sun, from August 2014 (left) to May 2015 (right), before the equinox that marked the end of the northern summer. Images adapted from Hansen et al (2016); animations courtesy of K.C. Hansen. Then, in May 2015, the equinox marked the end of the 5.5-year long northern summer and the beginning of the short and intense southern summer. At that time, the comet was about 1.7 au from the Sun, and scientists expected that the peak of water production would drift slowly from the northern to the southern hemisphere; instead, this transition happened more abruptly than predicted. This was likely due to the complex shape of the nucleus, which causes highly variable illumination conditions including self-shadowing effects. As expected, the production of water peaked between the end of August and early September 2015, about three weeks after the comet’s perihelion, which took place on 13 August, 1.24 au from the Sun. The data hint at possible variations in the water production rate at this epoch: these might be due to the spacecraft’s motion relative to the comet, but could also be an indication of actual changes to the outgassing dynamics, and will be subject of future in-depth investigation. The water production rate predicted by simulations after the equinox of Comet 67P/C-G, which marked the beginning of the southern summer, and covering several weeks around the comet’s perihelion. Images adapted from Hansen et al (2016); animations courtesy of K.C. Hansen. In addition to the ROSINA measurements, Hansen and his colleagues collated a series of previously published measurements of the water production rate at 67P/C-G. These include observations performed with the Microwave Instrument for the Rosetta Orbiter (MIRO) shortly before and after Rosetta had reached the comet, data from the Visible and Infrared Thermal Imaging Spectrometer (VIRTIS) obtained between November 2014 and January 2015, and measurements from the Ion Composition Analyser, part of the Rosetta Plasma Consortium (RPC) suite of instruments, obtained between October 2014 and April 2015. RPC-ICA does not detect water directly, but rather measures the ratio of differently ionised Helium ions; since He+ ions arise mainly from collisions between alpha particles (He2+) from the solar wind and neutral molecules, such as water, found in the comet’s atmosphere, this ratio can be used to estimate the amount of water produced at the comet. Hansen and his collaborators have found some small discrepancies between the various data sets: for example, the measurements from ROSINA yield systematically higher values than those from VIRTIS. One possible reason for this is the different nature of the two experiments: ROSINA samples the gas in the coma at the spacecraft’s position, while VIRTIS tends to observe closer to the nucleus, where the water production activity is potentially more confined than it is further out in the coma. The difference in measurements techniques and the discrepancy could potentially indicate an extended source of water in the coma itself, for example icy grains that are lifted into the coma and turn into gas a few kilometers above the surface. Another difference was found between the MIRO measurements, which indicate a rising trend in the water production rate from June to September 2014, and the first months of ROSINA data, starting in August, pointing to an almost constant rate in the same period. “This could be explained if a sudden surge in the water production happened around the time of the first MIRO measurement, a few weeks before Rosetta’s rendezvous with 67P/C-G, and the beginning of ROSINA observations,” says Hansen. 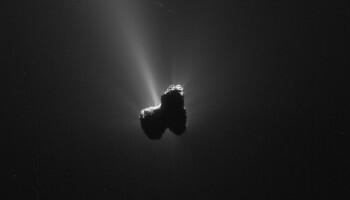 The scientists also compared the comet’s production rate of water to that of dust, which can be measured via ground-based observations and was recently reported in a study led by Colin Snodgrass of the Open University, UK. These observations were performed with a number of robotic telescopes across the globe, from Chile to Hawaii and the Canary Islands. “The correlation between the production rate of water and dust, both before and after perihelion, is impressive, suggesting that the gas-to-dust ratio remained constant over this long period,” explains Hansen. Based on the water production rate, the team estimated that the comet lost some 6.4 billion (109) kg of water to space over the period monitored by Rosetta, with the most intense mass loss happening near perihelion. The total mass loss, taking into account other gas molecules and in particular the dust, could be roughly 10 times larger than that and, if distributed uniformly across the comet nucleus, it would translate into a reduction of 2 to 4 metres. “This study shows how cross comparison between different instruments and simulations is beginning to reveal the comet further,” says Matt Taylor, Rosetta project scientist at ESA. “Connecting in-situ measurements from Rosetta with ground-based observations was a major science goal for the mission and it is wonderful to see this cooperation in action,” concludes Kathrin Altwegg, ROSINA principal investigator. “Evolution of water production of 67P/Churyumov-Gerasimenko: An empirical model and a multi-instrument study” by K.C. 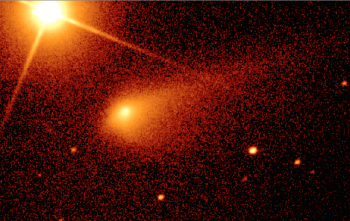 Hansen et al is published in the special issue of Monthly Notices of the Royal Astronomical Society, “The ESLAB 50 Symposium – spacecraft at comets from 1P/Halley to 67P/Churyumov-Gerasimenko”. 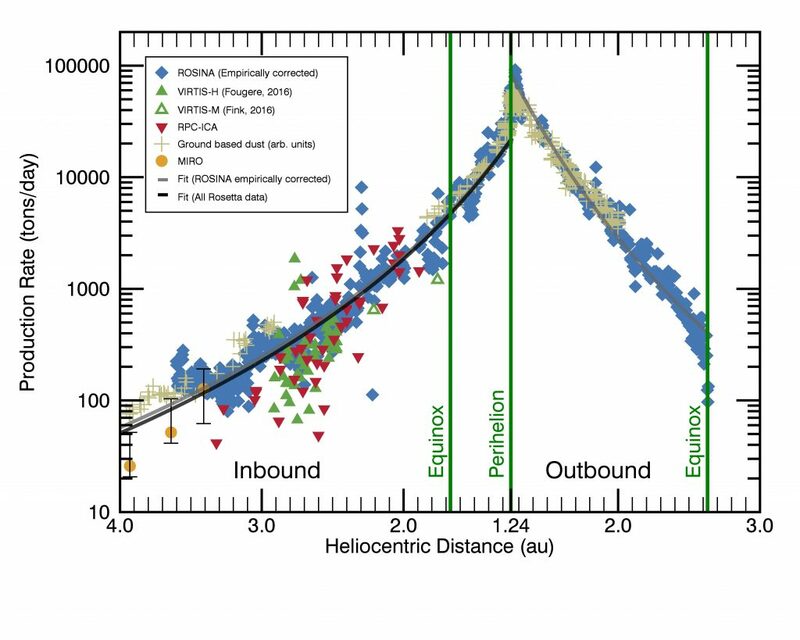 “Direct Simulation Monte-Carlo Modeling of the Major Species in the Coma of Comet 67P/Churyumov-Gerasimenko” by N.Fougere et al, and “The perihelion activity of comet 67P/Churyumov-Gerasimenko as seen by robotic telescopes” by C.Snodgrass et al are also published in the same special issue. Hadn’t realised the peak production was quite so high. I think the largest number I’d seen was 1 x 10^28 mol/s (~ 300 l/s). This paper reports ~ 3.5 x 10^28 mol/s (~1000 l/s). The mass loss seems huge, but on closer inspection represents less than 1/1000th of the comet’s total mass. Could this mass loss be considered as a reason for it to lose orbit height? Interesting to see an exponential production rate roughly proportional to the inverse of the solar distance. My out-of-the-hip expectation would have been a slow-down to an inverse-square production rate at some point. So, it seems, that temperature is the constraining factor all the way down to perihelion, not power by solar illumination. Are We seeing a dominantly thermic energy ‘sinking’?